RBTH presents a selection of views from leading Russian media on international events. 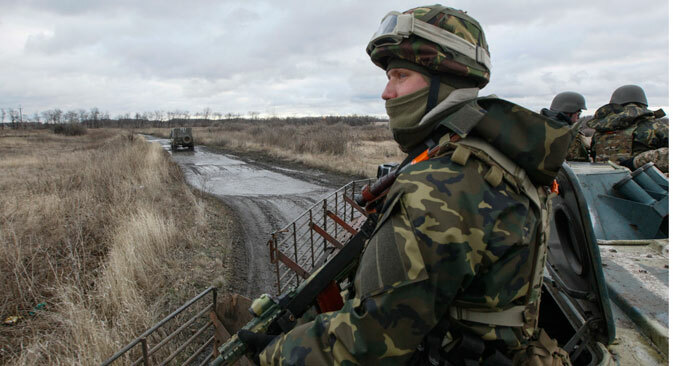 Today, military actions increase in southeastern Ukraine, and travel restrictions in and out of the Donetsk and Lugansk regions are put in place. Also, Latvia’s foreign minister gives an interview to Russian press as his country takes over the presidency of the Council of Europe. Pro-government daily Rossiyskaya Gazeta writes about an escalation of military action in southeastern Ukraine. According to the newspaper, active fighting has resumed along nearly the entire frontline in the Donbass. The newspaper reports that the Ukrainian army has begun shelling Donetsk and Gorlovka, and that both cities have been left without a water supply. The fighting also damaged the largest mine in Ukraine, trapping 364 miners underground, although they were rescued a few hours later. “It is surprising that the Ukrainian army has decided to aggravate the situation after a prolonged ceasefire and a certain level of normalization noted not only by representatives of the OSCE, but even NATO,” Rossiyskaya Gazeta writes. Mikhail Pogrebinsky, the director of the Kiev Center of Political Studies and Conflictology, told the paper that the military action might be part of a strategy by Kiev to secure a more favorable position in the upcoming peace talks. Centrist newspaper Nezavisimaya Gazeta writes that Ukraine has placed restrictions on citizens entering and exiting the territories controlled by the Donetsk and Lugansk People’s Republics, and vice versa. Now, people can only cross the conditional border with a pass. The breakaway republics have characterized these constraints as a blockade of the region. A statement by Secretary of the Donetsk People’s Republic’s Security Council Alexander Khodakovsky has been published on the region’s information portal. It reads: “Kiev’s decision to introduce a special pass for exiting and entering the Donetsk People’s Republic completely contradicts the Minsk memorandum on a peaceful resolution to the conflict. Over the past several months, residents of the Lugansk and Donetsk People’s Republics have regularly left the regions to collect their pensions and other social benefits. The practice has been dubbed “pension tourism” by the local media. The Kommersant daily has published an interview with Latvian Foreign Minister Edgar Rinkevics in which the minister discusses his country’s priorities for its Council of Europe presidency. Latvia will hold the presidency for the first six months of 2015. “In Moscow, I saw a mindset aimed at resolving issues on the one hand. But on the other hand, when it comes to detailed discussion, disagreements come up, say, regarding demarcation lines or returning control over the Russian-Ukrainian border to Ukraine, constitutional reform, and decentralization,” Rinkevics said. “Much depends on how the situation in eastern Ukraine unfolds. And where we must understand each other, of course, is on Crimea. We know that Russia considers the issue closed, and I think our disagreement will continue for a long time. After all, this is a fundamental issue for both sides. This is Latvia’s position on the sanctions: If we see positive developments in eastern Ukraine, we will support easing and lifting a portion of the sanctions,” Rinkevics said.